President Taylor was seen as the greatest obstacle to the compromise because he refused to sign it as one comprehensive piece of legislation, wanting to consider separately the issue of California's admission into the Union as a free state. The South feared that if California was admitted as a free state, other western territories would eventually become free states, thereby giving the antislavery movement a more powerful voice in Congress. In the summer of 1850, Taylor became even more hostile to the South when he threatened to lead the U.S. Army against the Texas militia, which was trying to spread slavery westward by threatening Texas's boundary with the territory of New Mexico. This never transpired because on July 9, 1850, Taylor died suddenly and Fillmore was sworn in as president. 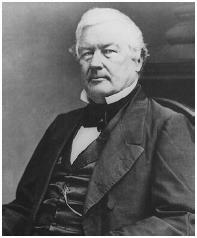 Fillmore supported the compromise, but he too wanted the legislation divided into separate bills. With the departure from the Senate of the compromise's strongest supporters—Clay, Daniel Webster, and John C. Calhoun—and the maneuvering of new leaders such as stephen a. douglas, Jefferson Davis, and William H. Seward, the bill was split up. Only three months after Taylor's death, all the separate bills were passed by Congress and signed into law by Fillmore. COLONIAL LEGISLATORS WHO BECAME PRESIDENT PRESIDENT STATE George Washington Virginia John Adams Massachusetts Thomas Jefferson Virginia James Madison Virginia James Monroe Virginia STATE LEGISLATORS WHO BECAME PRESIDENT PRESIDENT STATE John Quincy Adams Massachusetts Martin Van Buren New York William Henry Harrison Ohio John Tyler Virginia James Polk Tennessee Millard Fillmore New York Franklin Pierce New Hampshire James Buchanan Pennsylvania Abraham Lincoln Illinois Andrew Johnson Tennessee James Garfield Ohio Theodore Roosevelt New York Warren G.
President Millard Fillmore would sign it into law on Monday. CASE FACTS: Jill Syracuse brought suit for medical malpractice against Millard Fillmore Hospitals, d/b/a Hand Center of Western New York (Hand Center), Dr.
A surveillance program designed to track the global trend in gram-positive pathogens and their susceptibility to antimicrobials has been launched by the University of Iowa College of Medicine in Iowa City, Iowa, in conjunction with the clinical pharmacokinetics laboratory of Millard Fillmore Hospital, Buffalo, N.
This mutual conflict began off Uraga, at the entrance to Tokyo Harbour during July 1853 when commander Matthew Calbraith Perry, bearing missives from President Millard Fillmore, ordered cannon to be fired to persuade a reluctant Japan to co-operate with US interests. Rather than rehashing the fight between the Democrats and the emerging Republican party, Holt focuses instead on the fusion candidacy of Millard Fillmore, the campaign's clear loser. He was also secretary of the navy in the cabinet of President Millard Fillmore. The Buffalo General Hospital, Erie County Medical Center and Millard Fillmore Hospital in Buffalo, along with the UB medical school, will come online during the first phase. He was succeeded by his vice president, Millard Fillmore (1800-1874), who became thirteenth president of the United States. Millard Fillmore, 13th president of the United States, was born in Locke, now Summerhill, in northwestern New York. Grant, Andrew Johnson, James Buchanan, Millard Fillmore, or Franklin Pierce.